You do need to take your car in. I got around to doing this last week. I went in and they ordered the new EVSE. It only took a couple of days for them to call and tell me the parts were in. Apparently in addition to the EVSE they replace the foam "organizer" for the new cord which conveniently didn't fit my tire pump. On the old EVSE they cut the cords in 4 places so it cannot be reused and send the pieces back to ford so they get credit for the new EVSE. So for me it only took about 5-10 minutes of waiting for them to do this. If your EVSE part number ends in "AF" or earlier (a letter alphabetically before "F") this recall applies. 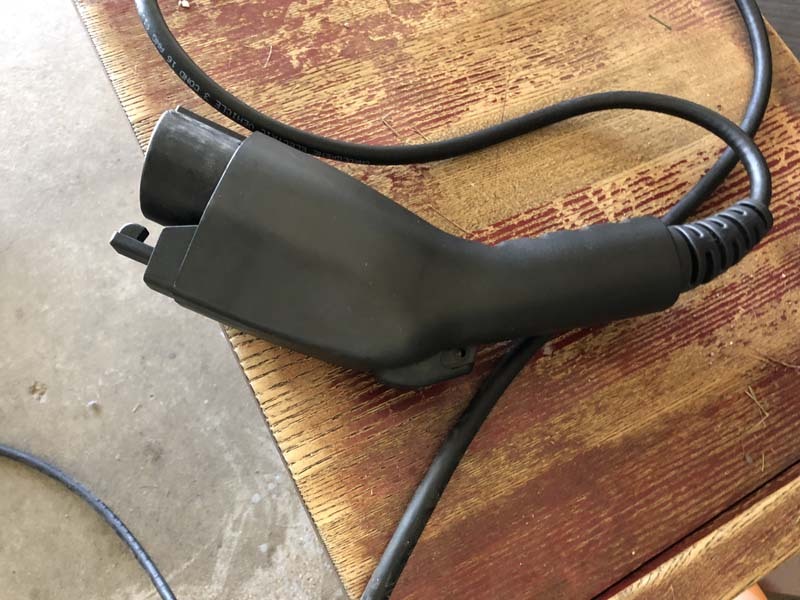 if your EVSE part number ends after "AF" (ie "AG" "AH" etc..) it does not apply to you. I thought I saw it on here but maybe it was elsewhere I read about who makes the replacements and that they are 240V capable. I can't seem to find it now if anyone has any links or info I'd greatly appreciate it. Hey EVA, do you happen to have a picture of that new EVSE? Thanks. 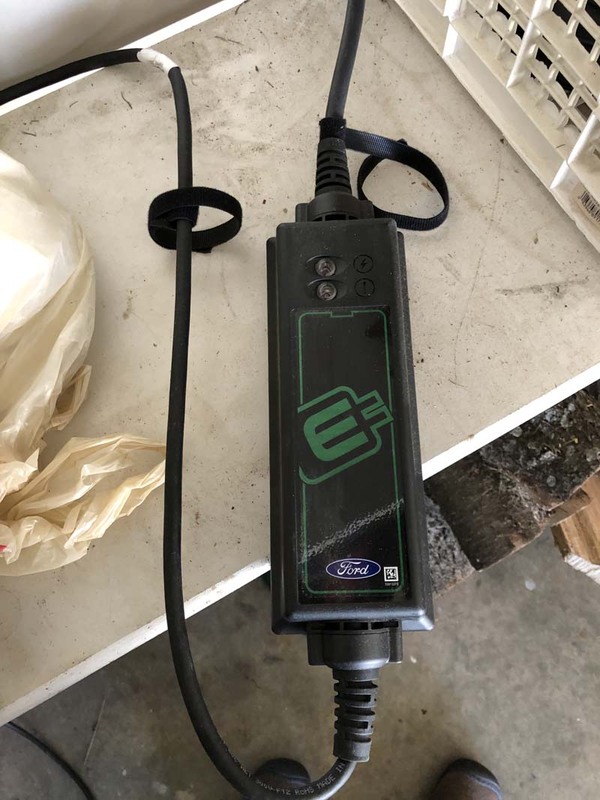 EVA, could you also post the part number of the new EVSE? Thanks. Sure - sorry I didn't get to this sooner. Doesn't appear to have a part number on the unit. Ah look at that, a generic black handle - did away with the Ford branding - darn. Triangles - that is a different experience from me. They really didn't need or want the car. Nice you took it in and they carved up the cubby hole. If I had to guess, you live in an area where there are more than one FFE's and they had some experience with the car. The place I went to, they've never seen an FFE or a charging cable. If I had to guess, you live in an area where there are more than one FFE's and they had some experience with the car. The place I went to, they've never seen an FFE or a charging cable. Nope, EVs are pretty sparse in Ohio. You are somewhat correct though, besides mine they have seen exactly 1 other FFE. So yes they have seen more than one. It's just that they've seen so much of my Fix Or Repair Daily FFE that they have become familiar with it. The problem is getting past the clueless appointment scheduling people and to my service adviser who I have on speed dial. I basically made an appointment and then talked to the service adviser who can grease the skids to so to speak and make things go smoothly. I wish I still had the original cubby insert as the air pump doesn't fit the new insert. I can easily fix that with a hot knife since it's just foam. Still wish I could find where I read about who made it and whether or not it is 240V capable. 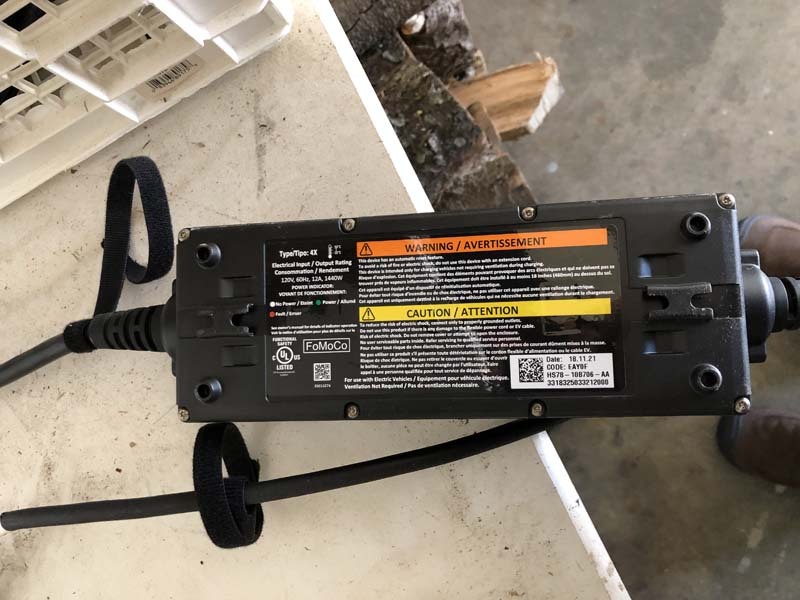 So I did a little digging and it looks like the warranty charge cords are indeed 240V capable. Just need a plug adapter. Since I'm temporarily unemployed I'm not spending any money I don't have to. So I will wait untill I'm employed to make my plug adapter. Makes me want to crack open the one in my Bolt to see if its the same ! (I don't even think I've taken off the plastic for that guy LOL). It doesn't guarantee you won't let the smoke out if it's not 240V capable but makes it much less likely. I'd be surprised if they supplied a different EVSE than the Volt with your Bolt. Swapped 120v charge cord at Ford dealer today; took about 45 minutes. (in my 2015 FFE, with estimated capacity about 18 kWh, so maybe 1.1 kWh gain). My PG&E meter showed about 1.36 kW being sent to car. Felt just a slight warmth in the heavy cord, and even less warmth in the plug at 120v. outlet. Saw a neat electric tire pump in the new foam assembly, did not try it yet. Seems to have switch for inflate vs. repair, if I interpret the little images right. Heavy cord is 3 cond. 16 AWG + 1 cond. 18 AWG, made in USA. Triangles, nice job finding the details about the Bolt EVSE . Wow - 111 pages of conversation. Amazing how the boxes look like exactly the same thing. Thanks EVA. I'm not really sure how I stumbled upon it, but I'm glad that I did. I was surprised that the board revision for the '16 bolt EVSE was the same revision as the board in my recall replacement EVSE.